Our story with elephants starts nearly 30 years ago in Zimbabwe when Rory Hensman was given "unmanageable" elephants to train. Since then, more than 30 elephants have been rescued and trained for educational purposes in the name of conservation. We have also loved and cared for countless other animals like warthogs, kudu and steenbok to name but a few. Today we care for 7 elephants, 3 females, 2 males and our two little babies Bela and Zambezi, at Adventures with Elephants. Our training methods are a combination of verbal commands and praise, body language and aids, targeting, clickers and of course food rewards. All our training is carried out with the utmost respect for our charges. Just like a happy cow will produce more and better quality milk, a happy elephant will help us show him/her off to our guests. Keeping our elephants healthy, happy and stimulated is an absolute priority for us at AWE and we work continuously on building and keeping trust and rapport between us and our charges. When not interacting with the public the elephants are left to be elephants on our 300ha game reserve where they can free range feed, play, or bathe. Besides making sure they exercise regularly, and are well fed and watered, we use daily training and props like balls to keep them mentally agile and used to small things around their feet. We supplement their diets with Bana grass, oats and lucerne, game pellets, fruit and vegetables during the year and conduct daily health checks. They sleep in large stables where they are monitored, protected and fed throughout the night. Besides elephants, a visit to AWE almost always includes a cuddle with our 7-year old resident meerkat, Trouble, who was given to us by the neighbouring reserve when the Alpha female of the group threatened to kill him. Baby Bela, full of character from when she was just a baby ellie. Bela as a 2 year old. Bela is the youngest member of the herd and the apple of her fathers eye. She was born on the 23rd of September 2016, to Mother Mussina & Dad, Chova. The name Bela was given to her because she was born in the Bela Bela area. Mussina is an amazing Mum and so protective of her little girl, who is extremely curious and playful. Little Zambezi was well protected by his mother Shan with extra protection from his aunt, Nuanedi here. Zambezi as a strong 3 year old. Zambezi is the 2nd youngest member of our family and was born on the 4th of October 2015. His parents Chova and Shan have been in our care for many years. He is named Zambezi because it was our father, Rory Hensman's favourite place in Africa. This young elephant is strong and goal-oriented but still enjoys playtime with Bela. It's a treat to watch him learn as he grows. Mussina, our 17 year old female is the natural leader of the group. She is happy to walk out in front and on her own. She helped Chova when he cut his trunk and collected branches for him, feeding him on occasion. During her early years in Mooketsi she would herd the cattle on her own without needing guidance from the handlers. Shan is our 18 year old female. 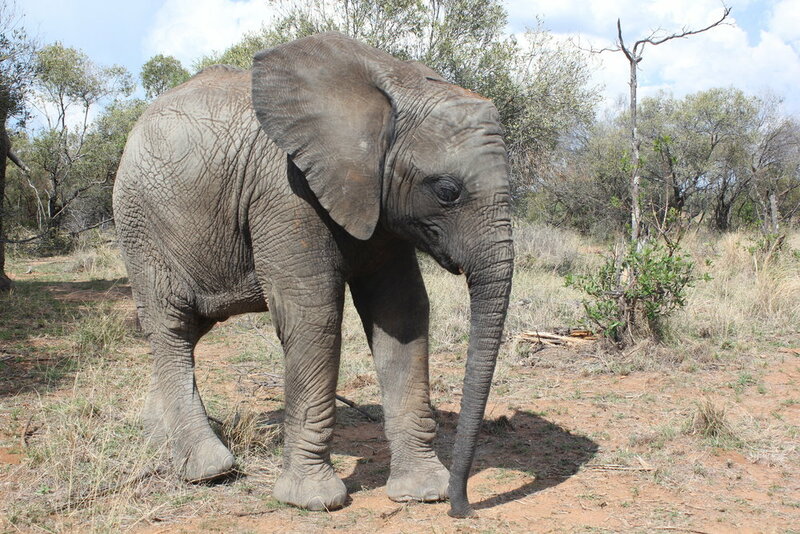 She may be related to Miss Ellie, the very first elephant we ever rescued in Zimbabwe. She is very responsive but being the oldest female of the group doesn't like to play much. This beauty is our accident prone 17 year old female. Since she's still young she's pushy for food but is a lovely elephant, fast learner and a fantastic aunt to Zambezi and Bela. Nuanedi cut her trunk on a loose wire some time ago. The cut never closed completely despite every effort by top veterinarians to stitch the hole. She's learnt to overcome her small problem with her good sense of humour. This is our 23 year old dominant bull with the short trunk and the insatiable water spraying habit! A real gentleman and sweet soul. He lost the tip of his trunk several years ago and despite the pain allowed us to clean and dress his wound. During his recovery he found and fed on certain plants which we found out later had healing properties. He recovered fully from his injury with no impact on his ability to feed. This is our magestic 21 year old male. He was the first elephant to take food from our hands and trusted us quickly. He is kind and always manages to make the team here laugh. Chishuru is a super fast learner and has featured in a number of films and documentaries. Shannon Wild, a well known wildlife photographer in South Africa, spent some quality time with our gentle giants recently. Watch the film and get a glimpse of who they are.